Starring Tamsin Greig, Women on the Verge of a Nervous Breakdown brings musical comedy to the Playhouse Theatre for a limited 20 week run. Adapted from the 1988 film of the same name starring Antoni Banderas, the show tells the tale of a group of women living in late 80’s Madrid and their tempestuous love lives. Opening with the on and off relationship between Pepa and Ivan, it becomes clear that love is a tricky thing. Fun and frivolity ensue as a group of women appear, like the title, on the verge of a nervous breakdown! Despite bring fraught with emotion, the show is in fact a musical comedy that will have you laughing at the assorted trails and tribulations of the women. 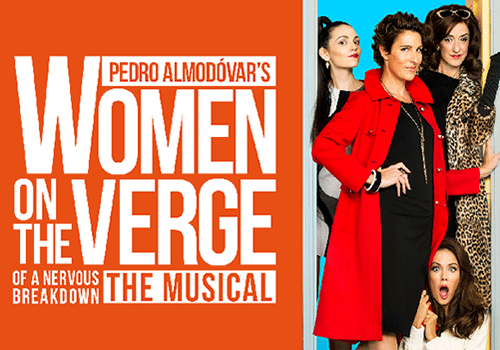 The power duo, David Yazbek and Jeffrey Lane (Dirty Rotten Scoundrels) team up Once more to bring Broadway’s Women on The Verge of a Nervous Breakdown to the West End. With a book by Lane and music and lyrics by Yazbek, the show promises to be riotous fun! Tamsin Greig stars as Pepa. Further casting is yet to be announced. Women on the Verge of a Nervous Breakdown IS NOT aimed at children. The show contains many scenes of an adult nature.